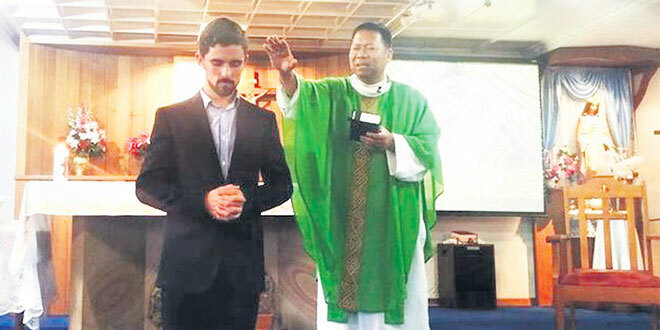 Farewell blessing: Nathan Webb receives a blessing from Sacred Heart Church, Toowoomba, parish priest Fr Roque Maguinsay. PARISHIONERS at Sacred Heart Church, Toowoomba, fraewelled one of their own, Nathan Webb, on February 14 but are delighted his destination was the Holy Spirit Provincial Seminary in Brisbane. Mr Webb, 18, said he had always felt the calling to become a priest and after a number of years of discernment had decided to take the next step. “It’s kind of appropriate I’m entering on Valentine’s Day because I’ve found my true love,” he said. Mr Webb said he made his decision based on the examples he had around him growing up in the Sacred Heart Parish. Parish priest Fr Roque Maguinsay presented Mr Webb with a breviary as a farewell gift on behalf of the parish. Fr Maguinsay said Mr Webb himself had been an example to others in the parish. He was involved in all aspects of music ministry, trained altar servers, and sat as a member on the parish pastoral council and the liturgy committee. “He gives himself totally to the Lord,” Fr Maguinsay said.